Delft University of Technology (Dutch: Technische Universiteit Delft [ˈtɛχ.ni.sə ˌy.ni.vɛr.si.ˈtɛi̯t ˈdɛɫ(ə)ft]), also known as TU Delft , is the largest and oldest Dutch public technical university, located in Delft, Netherlands. With eight faculties and numerous research institutes it hosts over 19,000 students (undergraduate and postgraduate), more than 3,300 scientists and more than 2,200 people in the support and management staff. The university was established on January 8, 1842 by King William II of the Netherlands as a Royal Academy, with the main purpose of training civil servants for the Dutch East Indies. The school rapidly expanded its research and education curriculum, becoming first a Polytechnic School in 1864, Institute of Technology in 1905, gaining full university rights, and finally changing its name to Delft University of Technology in 1986. 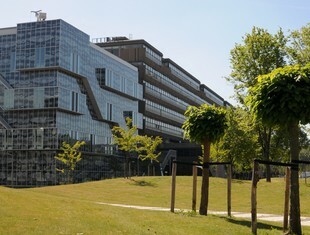 Nobel laureates Jacobus Henricus van 't Hoff, Heike Kamerlingh Onnes, and Simon van der Meer have been associated with TU Delft. TU Delft is a member of several university federations including the IDEA League, CESAER, UNITECH, and 3TU.